Get ready for years of colorful comfort in this robust cotton T-Shirt, available in a spectrum of lively hues. 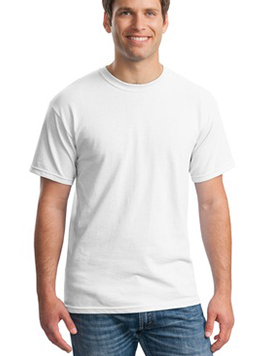 5.3 ounce 100% cotton (preshrunk) seamless double-needle collar tee shirt. Double-needle sleeves and hem, with taped neck and shoulders. Ash 99/1 cotton/poly. Sport Grey Antique Cherry Red Antique Irish Green Antique Jade Dome Antique Orange Antique Sapphire 90/10 cotton/poly. Blackberry Russet Tweed Heather Military Green Heather Red Heathered Sapphire 50/50 cotton/poly.